This certification was developed in response to the need for competent facilitators. Facilitation is the discipline of presenting instructional content and executing learning tactics, while effectively engaging learners and managing group dynamics so attention is on comprehending, retaining, and mastering skills. 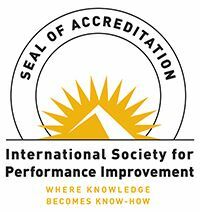 The certification is awarded by the Center for International Credentials, LLC (CIC), in collaboration with and endorsed by the International Society for Performance Improvement (ISPI). It is administered and awarded in Africa and the Middle East by the International Certifications Centre. This certification is intended for professionals with demonstrated expertise in facilitating live and online learning events. This certification is not designed for people who facilitate decision-making meetings, such as strategic-planning sessions; psychological interventions, such as addiction or self-mutilation; or the resolution of conflicts, such as business or family disagreements, and the like. To be eligible to apply for the certification, you must have the equivalent of three-years’ experience facilitating learning, with at least 50% of that time dedicated to facilitation. The premise is that facilitation is a skill that is honed over time rather than mastered on the first try. The experience can be either for facilitating learning events for remuneration or as a volunteer. 1. Submit attestations completed by people who have witnessed you facilitating different learning events. The events must have been at least 90-minutes long. Attestations are statements by a third party that validate a) your performance over time and under real conditions and b) the longer-term performance of your learners. The attestations can be from direct supervisors, internal or external clients, or sponsors. 2. Submit a set of end-of-course evaluations for one learning event of at least 90-minutes in length, completed by participants. The evaluations must include questions about your skill as a facilitator and how that facilitation enabled them to apply the skills. A practice exercise such as a role-play or analysis of a case study. The recording should contain approximately 10 minutes of lecture, 10 minutes of facilitating a practice exercise, and 10 minutes facilitating a discussion and debrief. You can adjust the times depending on the nature of your topic. As a guide, each segment should be at least 5-minutes long, and the total time should not exceed 35 minutes. 4. Agree to the Certified Facilitator Code of Conduct, the Declaration and Release, and the Application Agreement. 5. Agree to maintain the designation. 6. Display the certification marque or logo in personal and professional physical and online materials, unless prohibited by your employer. 7. Submit payment with your application. 1. Earn 40 recertification credits by participating in continuing education events related to facilitation, presentation, or adult learning. One credit is equivalent to one hour of training. 2. Complete and submit the online recertification form. 3. Recommit to the Certified Facilitator Code of Conduct. 4. Submit a recertification fee. For information, see the Handbook.